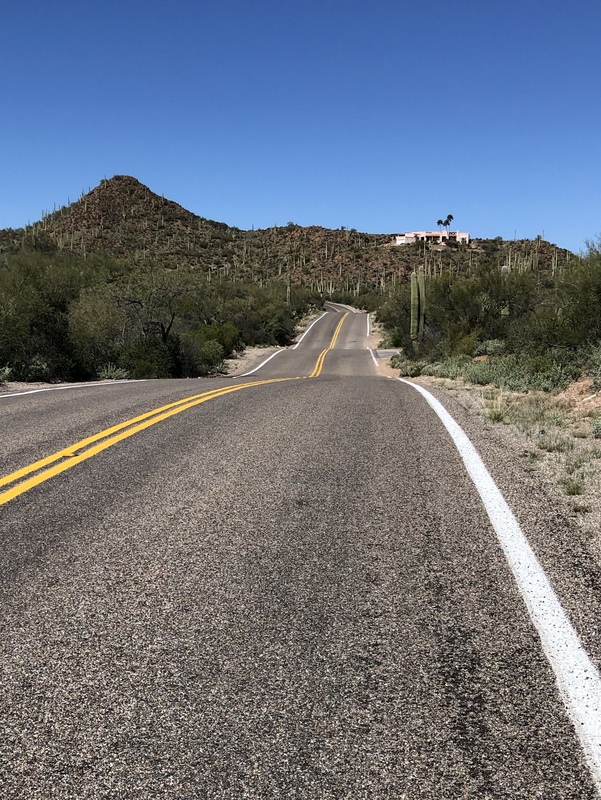 The Seven Snakes of Silverbell are seven roads that head up into the Tucson Mountains, from A-Mountain (Sentinel Peak) in the South, to Sunset Road in the North. The ride is about 75 miles with 4,700 feet of climbing. You can obviously start either end, but I chose to start at the Southern end as this way you start with the busiest roads and end with the most beautiful. Unfortunately this means you cross Silverbell twice at most of the intersections, but usually you have traffic lights. I rode this March 18, 2019, and parked at the intersection of Sweetwater and Silverbell so I could refuel before the last three climbs. 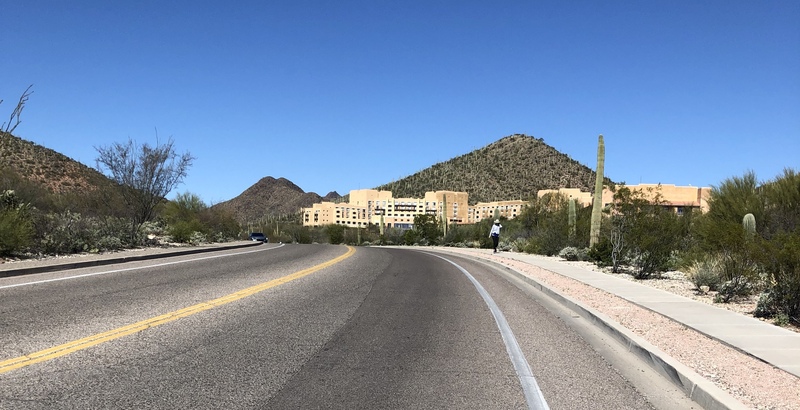 If you want to start at A-Mountain, there is lots of parking around the Mercado San Agustin, just off Congress, a few blocks east of the Sentinel Peak Road. A-Mountain / Sentinel Peak. Round trip of 1.9 miles with 415 feet of climbing. Start at the corner where Silverbell and Congress intersect, and follow the signs for Sentinel Peak, also known as A-Mountain. It’s a popular climb but the road is a little rough in place. The road is reasonably steep, with a couple of sections that are extra steep. After an initial moderately straight section, the road curves left and steepens. After this section, the road splits and becomes a one-way road around the mountain. Follow this round and back down. Turn left and follow Silverbell road for about half a mile to W. Anklam Road. 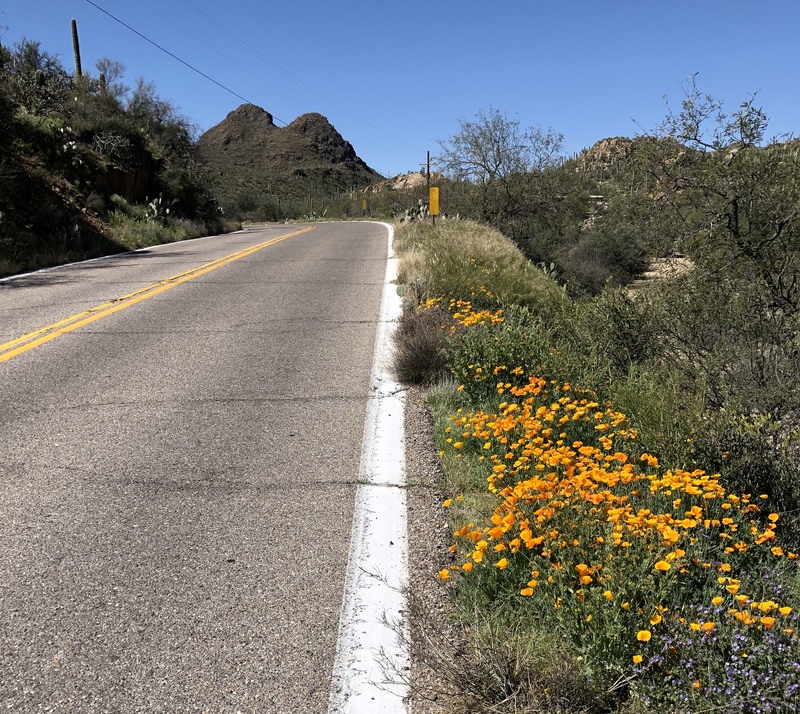 Anklam Road to Starr Pass. Round trip of 7.8 miles with 450 feet of climbing. Ride up W. Anklam road, turning left at the traffic light, following the sign for W. Anklam Road (to the right is St. Mary’s Road, which you’ll follow on the way down.) From the traffic light, ride up the lovely smooth road for about 1.7 miles to Players Club Drive on the left. Turn left following signs for Starr Pass. The next section of road is disappointingly rough, but you eventually reach Starr Pass Blvd where you turn right. Continue up to the Marriott hotel, and continue up the wonderfully steep road as it curves left up and around the hotel. Follow the road all the way round the back of the hotel then down and around below the hotel, back to Starr Pass Blvd. Turn left, then left again on Players Club Drive, and back down to W. Anklam Road. At this point you could turn left and continue up to Gates Pass, but the point of this ride is to do each climb starting from Silverbell. So, turn right and head back down to Silverbell. Instead of doing the lower section of Anklam, continue down St Mary’s Road to Silverbell, then turn left and ride about 0.8 miles to Speedway. Speedway to Gates Pass. Round trip of 12.1 miles with 1020 feet of climbing. This is the busiest of the fingers, and the road is narrow and needs repair in places in the upper section. Be careful on this road. The angle varies quite a bit, and there’s a brutally steep section of about 12% just below the pass and the big parking area on the right. Descend back to Silverbell, turn left, and ride just over a mile to Ironwood Hill Drive. Ironwood Hill Drive to Trails End. Round trip of 11.1 miles with 780 feet of climbing. 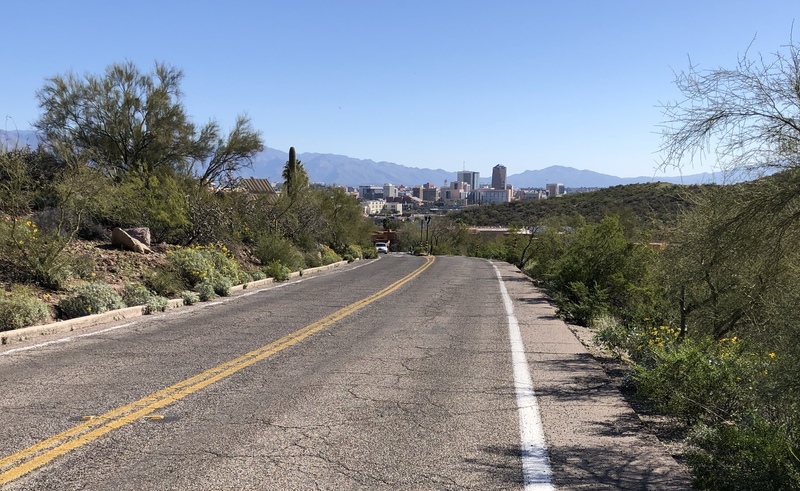 This is a two part climb, starting up Ironwood Hill Drive until it dead-ends at Camino de Oeste. Turn left here and ride up and over several steep rollers until Trails End Road turns off to the right. Trails End climbs fairly consistently until the road curves left then right, with a little sting in the tail is it rears briefly up to about 12%. After about 2 miles from the base of Trails End, you’ll reach the gate where you turn around. Above the gate are many houses in a spectacular bowl, with some incredibly steep-looking roads leading up to a few houses on the ridge line. Something to dream about. Back down at Camino de Oeste turn left and ride down to Ironwood Hill Drive, then down this to Silverbell. Turn left and ride for about 2.5 miles to the base of Sweetwater Drive. Sweetwater Drive. Round trip of 9.3 miles with 460 feet of climbing. 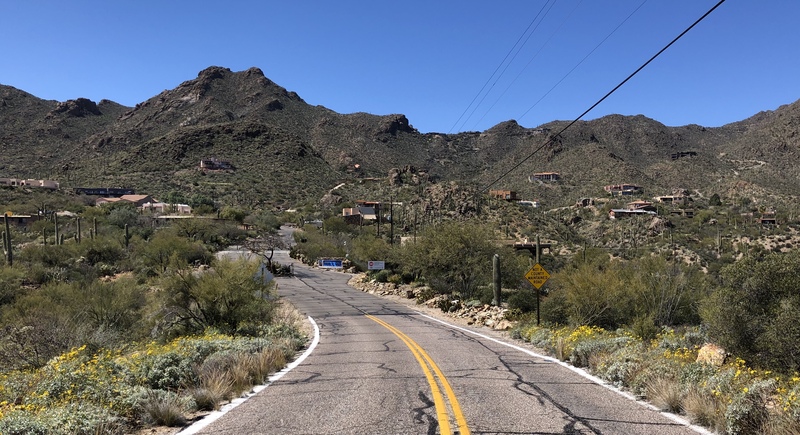 In about two miles the road splits, with Camino de Oeste turning left, and Sweetwater Drive continuing up to the right. Stay right. The road surface immediately improves and the traffic becomes rare. A sign says that the road ends in one mile, but this is not true. Instead, in one mile you will see signs that tells you the road is no longer maintained by the county. Instead it is a private road, limited to residents and invited guests. However, there seems to be no problem with cyclists riding up the road, and you will very likely see other cyclists on it. 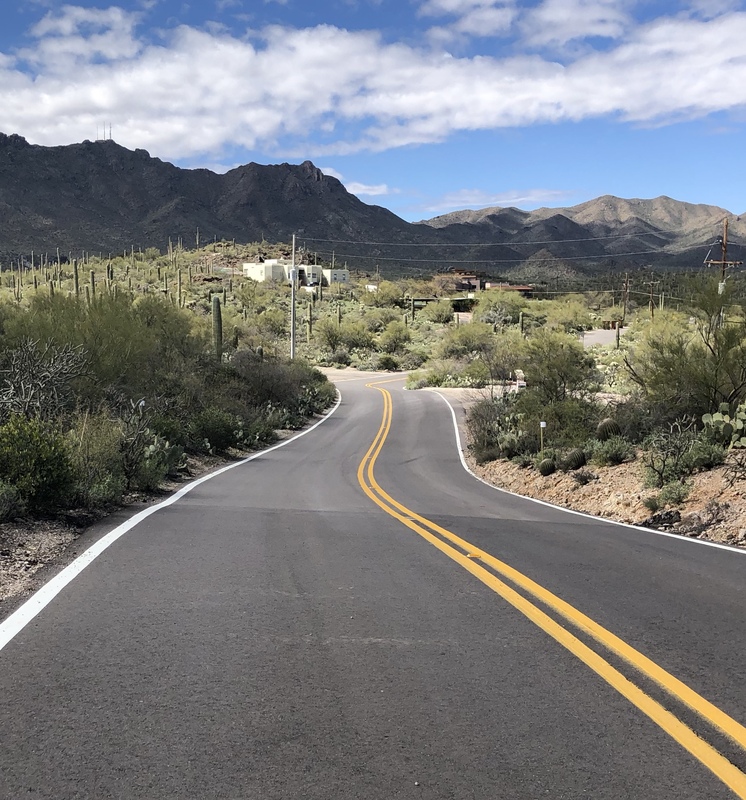 There are a few speed bumps before you reach the end of the paved section in another 1.5 miles, where the road splits and both branches are dirt. Again, the upper section is the most interesting, with more twists and turns. Head back down to Silverbell then turn left and ride along for about one mile to the start of El Camino del Cerro. El Camino del Cerro. Round trip of 9.7 miles with 700 feet of climbing. As you head up El Camino del Cerro you’ll see a sign on the right telling you the El Camino del Cerro Trailhead is 5 miles ahead. This is what you are heading for. The last 2.5 miles of this climb are simply incredible. The road twists and turns and dips, with lovely views and some very steep short pitches, one of which reaches 13%. You end up at a bit dirt parking lot – this is the trailhead. Back down at Silverbell, turn left and ride about a mile to the base of Sunset Road. You’ll pass a traffic light with Sunset Road on the right. Ignore this and continue to where a much smaller Sunset Road climbs steeply up to the left. Sunset Road. Round trip of 7.9 miles with 695 feet of climbing. This road is a fantastic roller-coaster as it heads in to the mountains. Some of the dips are so dramatic that you can see where cars have bottomed-out their front ends. After you turn left, the cycling becomes truly wonderful as the road twists and turns and rolls, and you’ll even hit a short section of 14% before you reach the end where the road turns to dirt. 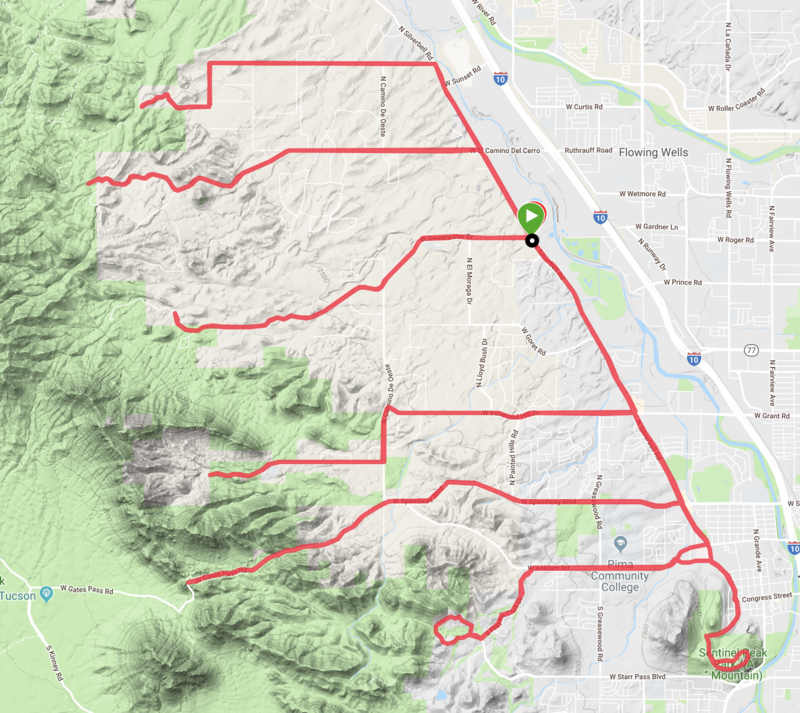 The Five Fingers of West Tucson, a shorter and easier version of this ride. There are some very steep short sections in these climbs. 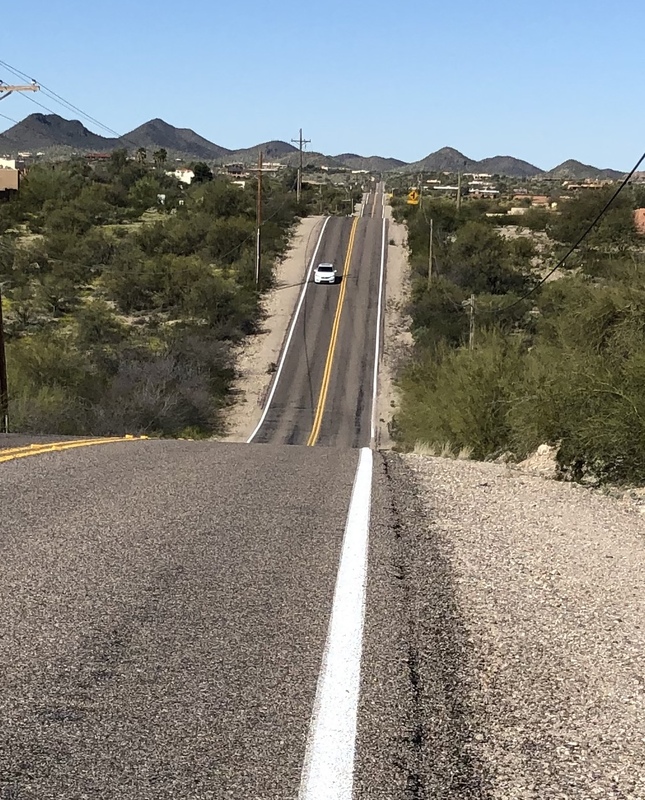 But there is another climb that is the Steepest Climb I know of in Tucson.